December 6 is Independence Day in Finland and this time around it marks a century of independence, snatched from Russia in 1917 while that country was distracted with the small matter of a revolution. Usually the occasion is marked with a sedate and rather tedious queue of dignitaries at the President’s Palace in Helsinki and the lighting of candles in windows. I’m hoping that this time things might get a little wilder, in view of the significance of the event. This is what Finns do when they win the Ice Hockey World Championships. It dawned on me today that I have been living in Finland for more than a third of its independent existence, having arrived laden down with luggage, a wide-eyed and innocent 26-year-old, on the Viking Line ship from Stockholm in late August 1982. Fitting, then, that I’m writing this on the Viking Line ship from Tallinn, not quite so wide-eyed or innocent. Narrow-eyed, in fact, after a trip through the Baltics that included one or two samples of various national beverages. Guaranteed to break the ice: the state-of-the-art Polaris icebreaker went into service in 2017, adorned with the Finland 100 logo. Like all expats, and in spite of having lived here for my entire adult life (which didn’t really start until about 1990 and which some might say has still to get going) I moan about Finland. I moan about the price of beer. I moan about how Finns, in spite of the price of beer and other drinks, go out of their way to get legless. I moan about the endless roadworks and construction sites, about how nobody says ‘thanks’ when I hold the door open for them. I moan about the length of the winter and how the guys with the snow ploughs pile up the snow in front of my gate. Probably unfair these days, since the guys with the ploughs are quite likely to be Estonian. About how the neighbours pile on the peer pressure by cutting their hedges immaculately while I let mine grow ragged. Nothing to do with the fact that they are Finnish, of course, and more to do with the fact that I am lazy. The Finnish winter – beautiful, but on the long side. A view from Lapland. Since I have also spent a large part of my professional life singing Finland’s praises in books and articles and radio interviews, I feel entitled to have a go at it sometimes. Of course, if this Brexit nonsense goes through I might have to think about being a Finn myself before too long. In which case, I suppose I’ll have to review my moaning strategy. A typically healthy blue-and-white Finnish complexion. But this week Finns are rightly taking the opportunity to celebrate all the good things about their country, and I have to own up to the fact that Finland has been pretty good to me when all is said and done. It lets me speak English most of the time for one thing. So I’m adding my voice to the chorus of congratulatory celebrations. The Finnish sauna. Had to be mentioned. This is a country that still has a fantastic health service which has come to the rescue of myself, my family and my friends on many occasions, at little cost, for example. It seems like a much more confident and outward-looking country than it was when I first came here. Not always as perfect as it would like to think, in spite of all those world surveys that say it’s best at everything. But pretty good when you compare it to various other countries. And anyway, any country that really was perfect would have to be pretty boring. So happy birthday, Finland, and thanks for all the opportunities you’ve put my way. And talking of opportunities, before the next century is up, just try to get the hang of the difference between opportunity and possibility. Onneksi olkoon, Suomi, ja kippis! A lamentably occasional photo blog in which I share some samples from my archives at www.timbirdphotography.com . Did you miss me? I’ve been away from here for far too long but I’ve had lots of adventures with my camera while I’ve been away. I don’t have a good excuse for not posting for a while apart from other creative distractions going on – more news of those to come. I shall try to make up for lost time in the coming weeks with some photo selections that I hope you’ll enjoy. I’ve been sifting through my archives and amazing myself at all the extraordinary things I’ve seen and the places I’ve visited since the last time I posted anything. Top of my list is the Theyyam ritual ‘performance’, for want of a better word, which you’ll only find in the northern part of the Indian state of Kerala. This is very much a living tradition, a ritual of great significance to local people, not just staged for tourists. There are often several Theyyams being performed each night during the winter season at shrines, many of them in remote villages. Theyyams can continue through the course of a night from dusk to dawn, and sometimes even longer. An important part of the ritual is the preparation, in which intricate make-up and elaborate costumes are applied to the ‘actors’, whose aim over the course of the enactment is to actually become the deity that they represent, not just play its part. The trance into which they attempt to enter is induced to the accompaniment of frenetic drumming. Only men and boys are permitted to represent the characters, and only members of the Dalit or low-caste community are allowed to serve as actors. It is a rare case of Dalits being held traditionally in great respect by members of higher castes. I stayed near the small fishing town of Kannur and attended three different Theyyams during my visit. Making up is very hard to do: face and body decorations preceding the Theyyam can take several hours and is a highly skilled art form in itself. After make-up, dressing up. Costumes are very colourful, and very heavy. A Theyyam character (there are hundreds of them) ready to ‘perform’. The character ‘actors’ need plenty of stamina. Some Theyyams involve dancing and the acting out of ritual scenes. Assistants provide support as the characters ‘become’ the deities they represent. If you’d like to see more of my Theyyam photos, click here to visit a gallery on my website. All photos produced with Fujifilm X-Series cameras and Fujinon lenses. Please follow this blog and watch out for the next edition! India is full of surprises. Just when you think the whole place is falling apart and there is no concern for order of any kind, you come across startling examples of method in the madness. Amritsar was my latest example of this. It’s as polluted as any city in India, more polluted than most, and the litter-strewn roads appear to be falling apart. An unhealthy haze hangs over everything. Yet when you enter the main compound of the Golden Temple, the Harmandir Sahib, you are immediately enchanted by a sense of calm and almost pristine cleanliness of a kind almost unknown on the daily outward face of India. This is the centre of the Sikh religion, a hybrid mix of Hinduism and Islam founded by the Guru Nanak in the 15th century. The original holy book of the Sikhs, the Guru Grath Sahib, is housed in the main shrine opposite the dazzling Temple, itself positioned in the middle of a ‘tank’ or artificial pool approached along a canopied marble causeway, rumoured to have healing powers for those who brave its chilly water. 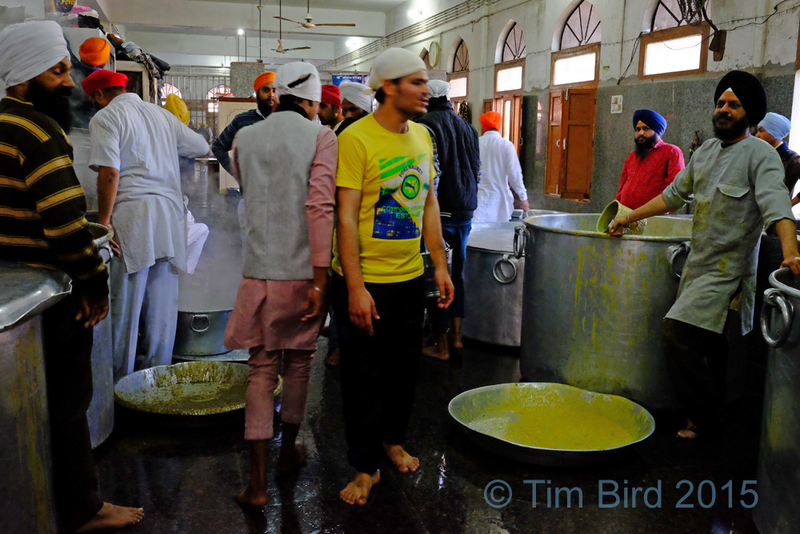 It’s a very gentle place, where verses from the holy book are chanted from loudspeakers, live ensembles of traditional musicians perform, and the tall bearded Sikh guards quietly ensure that etiquette is observed, like gentle bouncers. 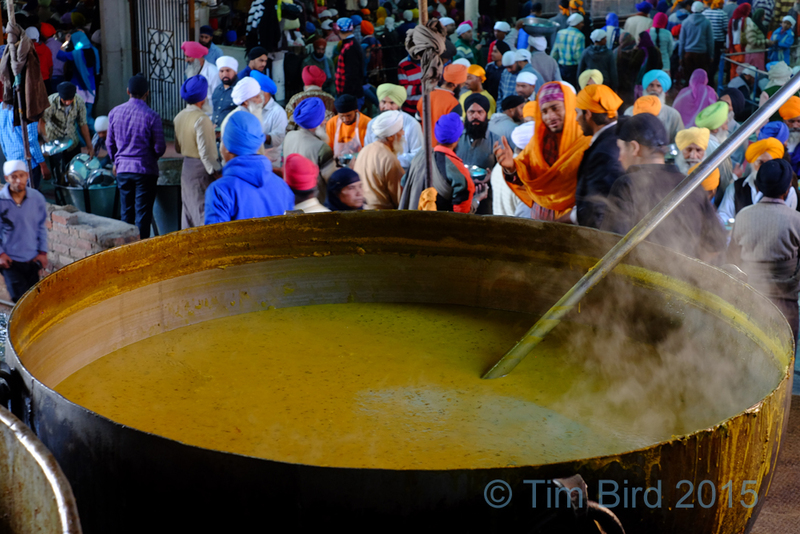 The Golden Temple is well documented and photographed – understandably. It is an extraordinarily beautiful apparition. 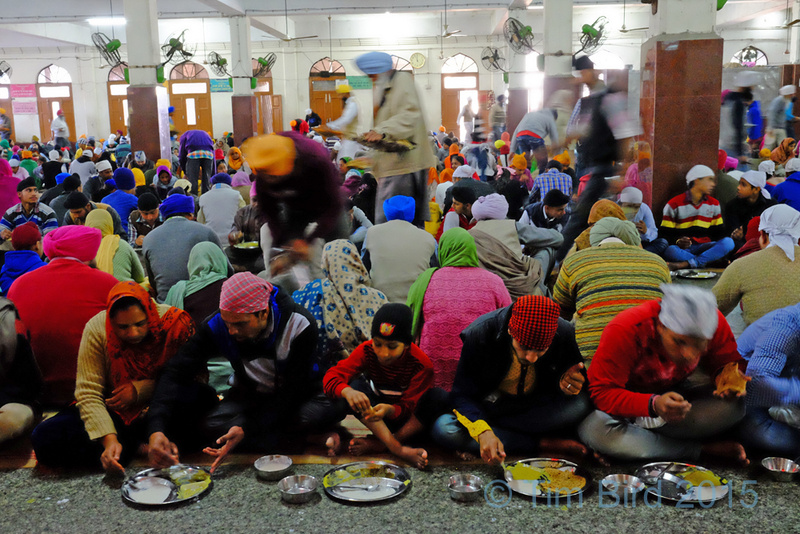 Less well documented is the refectory, the ‘langar’ or meal hall, where pilgrims and infidel foreign guests such as myself can sit cross-legged on the floor and eat little feasts of dal, sweet rice pudding and roti. 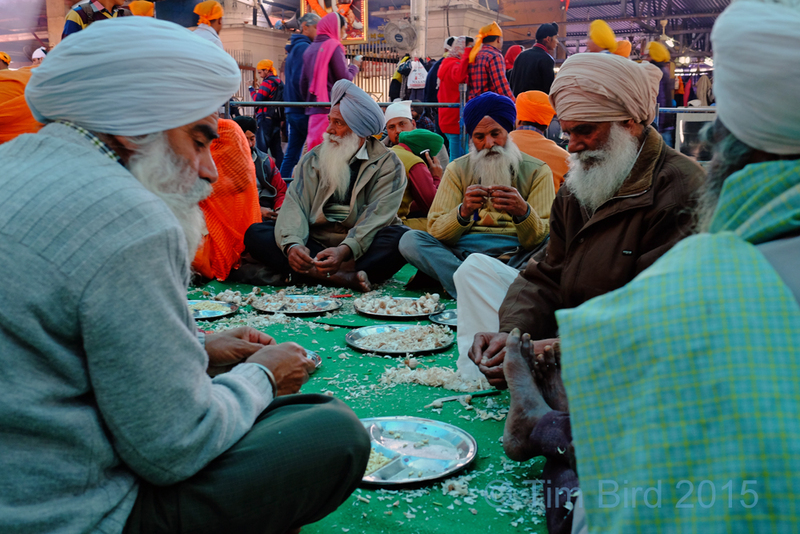 The all-welcoming open restaurant is symbolic of the open nature of Sikhism, which shuns the caste system of its cousin Hinduism, for example. I wandered into the huge kitchens quite unchallenged, greeted only with smiles and welcoming gestures – a dreamland for photographers accustomed to stern and grudging looks of admonishment. 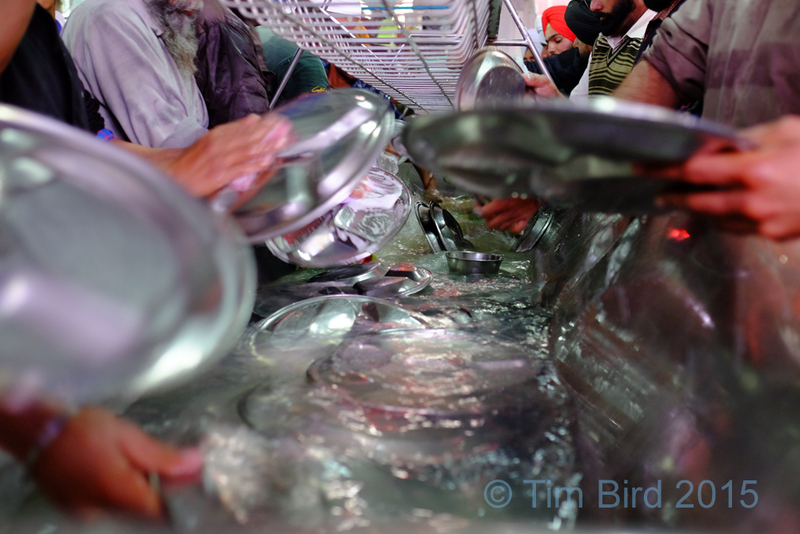 Vast vats of dal steamed away, the roti machine continued on its daily production of 60,000 pieces of bread, the volunteer dishwashers lined up to do their bit over troughs filled with clanking metal thali plates. And everything proceeding with the kind of clockwork efficiency that would put the Swiss to shame. Here are six images from my very memorable visit. Since other aspects of India, such as its sometimes dodgy wifi, are holding true to form as I post this, the pictures might not appear in any logical order at first, but I hope you get the idea!